Once in a while we need to either blow off some steam by exploding in a party, a nightclub or something similar. Or we need to blow off that steam by going to a completely quiet environment and stay there until the blood pressure is down a few points. I’m not much of a party guy, so the latter solution is more for me. Having been under some stress and tension for the last few weeks/months/years, I decided to go to a quiet place, shoot some birds or landscapes or whatever. Just relax and see what happens. 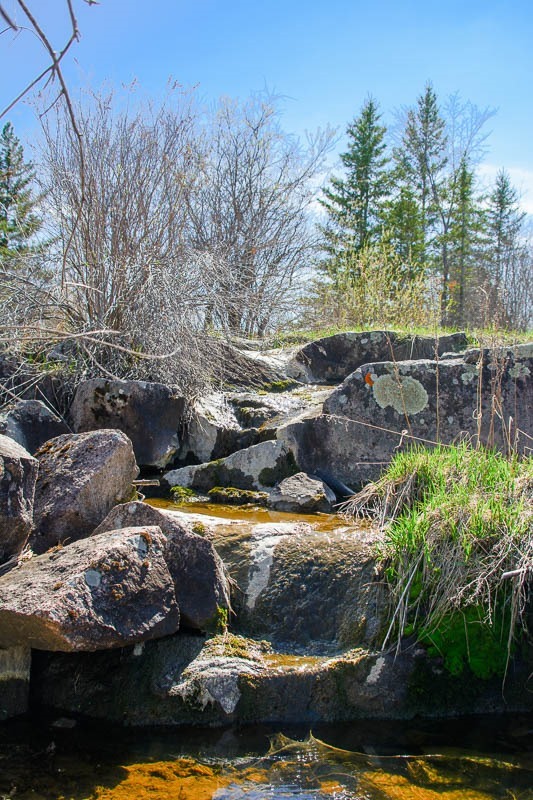 The area in question is not that far away from Winnipeg and has quite a few surprises, even to those who have been there before. The area is quiet, but it was not always like that. This was a high tension area from the early 1900 to around 1950. After that, it was used as a training/practicing area for the Canadian Forces, trying to explode as much of the structure as possible. That proved to be… not that much . 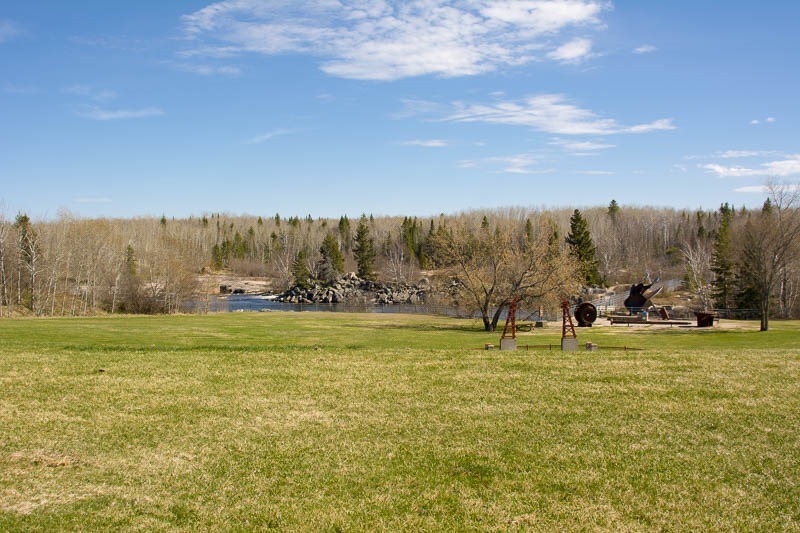 When the Forces moves out, the area was left unused for a while until the Friends of Old Pinawa decided to revive the area for tourism and recreation. The terrain was cleaned and sanitised, all dangerous situations were resolved and the park was opened. On the spot where once were houses and offices, now is a nice green field of grass and a small monument. 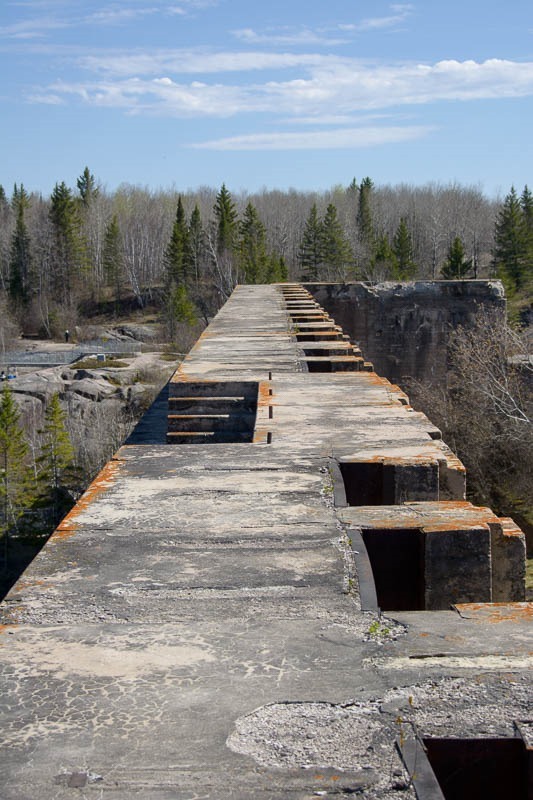 The hard part of the structure of the Hydro Dam, the first one in Manitoba, is still visible. 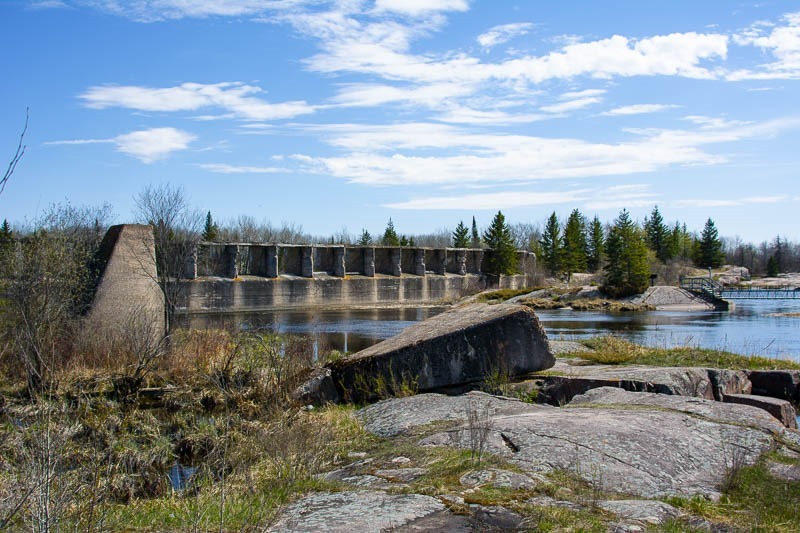 Although the floodway has been pierced so that there is no more water build-up in the retention lake behind the dam, water is still flowing all around. Now that same water is used by swimmers and water enthusiasts in summertime. Wintertime is a different matter. The water is still flowing fast but mostly frozen on top and highly untrustworthy. Better to go there in summer when the water is warmer too. 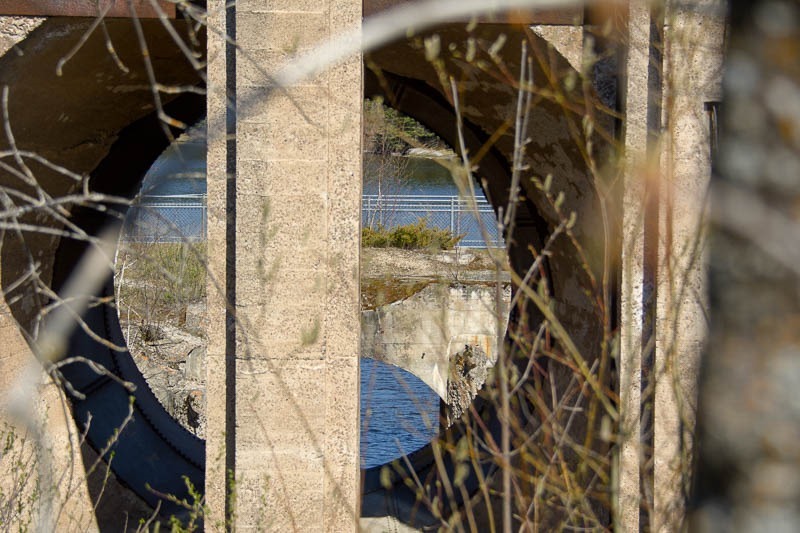 Some of the places that are rarely visited in the area lie behind the parking lot. The place is tick heaven, we had some 17 on us when we got out there. A clean grass path (no ticks on the path, they live beside it) leads to a number of secluded places, in the middle of the woods. 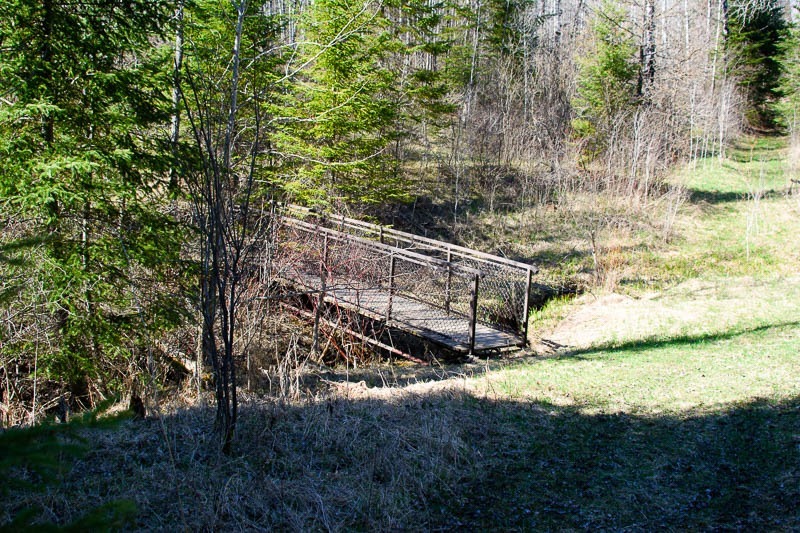 Until this bridge, the path is maintained, I suspect the lack of maintenance beyond it is a result of the mower not passing over the bridge. Back at the dam, some views are amazing. To stand in a place where once 226 cubic metres of water per second moved through is mind boggling. Today, the turbines have been removed and there is no more electricity coming out of this structure. Back in the day, the dam was providing all the electricity for the City of Winnipeg. 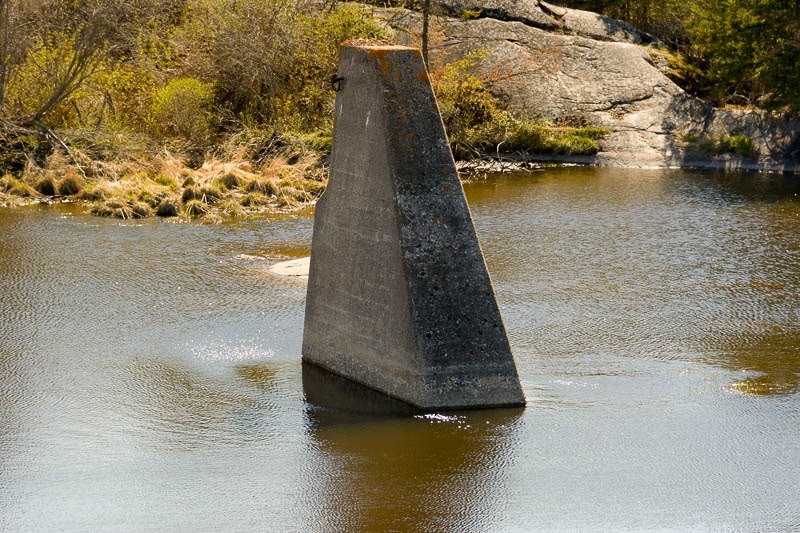 The dam itself is still standing, all moveable parts have been removed forever, leaving only the concrete skeleton. It is this skeleton that the Canadian Forces tried to demolish but did not succeed. They did blow a hole in the lower structures down stream, though. This time I didn’t go there to shoot any birds, I didn’t even take my long lens with me. 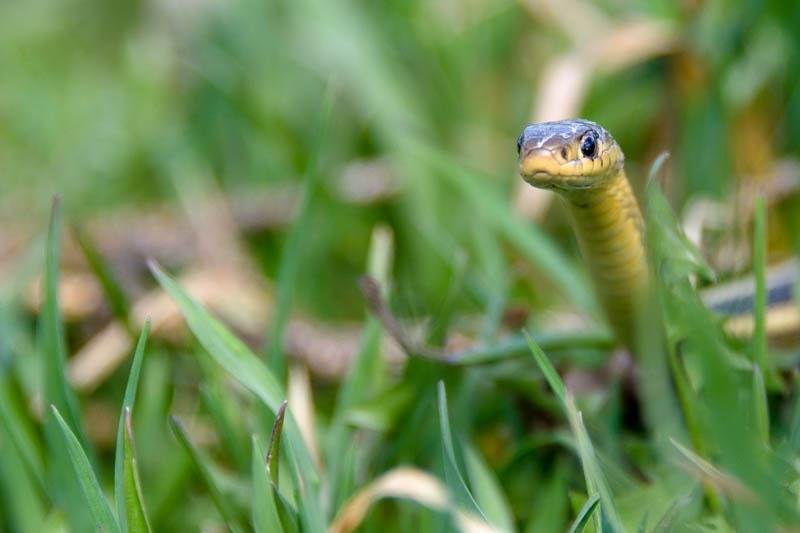 It made me miss a pair of American Kestrels, but oh well… Some other friendlier creatures were hiding in the grass. Their life of this year is just starting and most of the snakes look really young. This one looked at me as f to say “Don’t step on me, please!”. I didn’t, but shot it a few times, then we both parted ways. The area once was generating power for the city, now all that tension has gone. Ex-tension, if you will .